In 2006, Siddhartha profiled Imaad Wasif, after the release of his debut album on Kill Rock Stars Records. I had sort of forgotten about the post — and not really remembered Wasif’s music — until I was in a Barnes & Noble the other day. There I found, as an actual CD, Wasif’s third CD, The Voidist. (As a side-note, whenever this happens I’m reminded of how much I miss actual record stores. Music browsing on the internet just isn’t the same!) 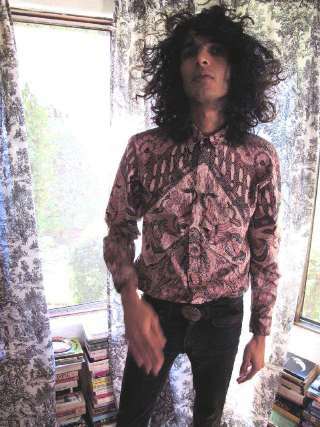 In between 2006 and now, Wasif had released a second album, Strange Hexes, and also worked with Karen O (of the Yeah Yeah Yeahs) on the soundtrack to Where the Wild Things Are. I’ve been listening to Wasif’s music all week this week, and this time I’m feeling it. (What do you think?) By comparison to the first CD, The Voidist feels more like 1970s rock ‘n’ roll, with some songs with big power chords. It’s also less confessional in tone (and less dark), and much more of a collaborative (band) effort than a solo performance. All that said, Wasif’s new CD also reflects less of an impact of classical Hindustani ragas, though I do hear some trace of them in “Redeemer” (see the somewhat mysterious official music video on YouTube. Note: Video is slightly NSFW, with artfully out of focus female nudes). You can download an early MP3 for Wasif’s “Out in the Black”, which has a clear raga/Hindustani influence, here. It’s actually one of my favorite tracks by Wasif. Another recommended track is “Oceanic“. All of his albums can be downloaded from ITunes, including the collaborative work he’s done on films. Kulwinder Singh, a 52-year-old Punjabi Sikh who works as a tow-truck operator, approached a young community organizer who was taping a promotional poster for the 2010 census to a wall inside his temple in Richmond Hill, Queens. Mr. Singh looked perplexed. “Population count,” the organizer, Herminder Singh, 19, explained in Punjabi, before launching into a detailed explanation of the survey. I saw Kuch Kuch Hota Hai with my family at the historic Raj Mandir theater in Jaipur, India back in the winter of 1998. I generally dislike what Bollywood has to offer but it was really hard to dislike that film. Good music, feel-good plot, fresh samosas at intermission. But Bollywood just can’t help but copy a movie already made. It even copies itself. Karan Johar decided he wanted to remake KKHH almost exactly like the original…but with animated dogs in the lead roles. This one is called Koochie Koochie Hota Hai. So what do you think 30-something desi parents? Is this destined to become part of the collection of movies you use to distract your kids with? If I ever see this playing in the back seat of an SUV on the road I fully reserve the right to roll my eyes derisively. I admit it. I watch two of the Real Housewives series [to be clear, I mean NY and NJ-- no ATL for me, that's alll mutineer Vinod ]. When it comes to mindless entertainment with which to while away time on a cardio machine, this reliable train-wreck is mesmerizing to behold. Today, the Daily Beast has confirmed from two sources that the so-called White House gatecrashers, whose prank ultimately cost presidential Social Secretary Desiree Rogers her job, are poised to take center stage once again as the most visible members of the upcoming Bravo series “The Real Housewives of D.C.” After one of the most visible reality series auditions in history–yes, Bravo cameras were on hand as the Salahis arrived for that ill-fated White House event–the couple has now been fully embraced as the focal point of the series, expected to premiere in July. Oh, good! They won’t be punished for their dangerous antics. Whew, that’s such a relief. I mean, let’s focus on what matters– good television! Yesterday I asked for help from SM readers (also known affectionately as the “Great Brown Horde”) to ascertain the identity of the man on Obama’s “lucky charm.” Thanks to an eagle-eyed reader we now have a definitive answer. 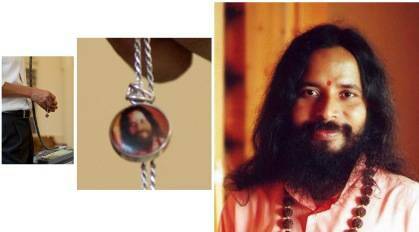 It is Paramahamsa Prajnanananda, the current spiritual leader of Kriya Yoga International. Paramahamsa Prajnananandaji is the president of Kriya organizations started by Baba Hariharanandaji Maharaj and the current head of a great lineage of Kriya Yoga Guru Parampara. Paramahamsa Prajnanananda is based in Puri, India, and travels up to 300 days per year, holding seminars and retreats all over the world. 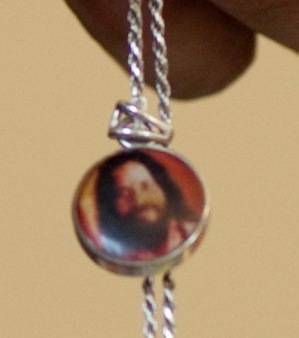 He runs the main Kriya Yoga ashrams in Balighai, Cuttack, Vienna, Holland , Miami, and the centers world-wide. He is also the founder of Prajnana Mission, which provides free medical assistance units and centers, residential schools for unserved areas, and many other charitable and educational activities. 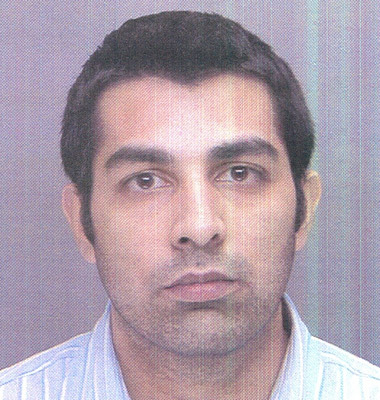 PSA: Yo Desi Ladies, Did You Date This Guy? In the past I have been accused by unruly commenters on this blog of being obsessed with President Barack Obama. No. That is false. Admiration is not obsession. I am however, endlessly fascinated (perhaps obsessed) by what is in the man’s pockets. In June of 2008 I cited this photograph in Time Magazine. 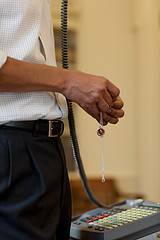 I openly (but with tongue-firmly-in-cheek) wondered, “is Obama a secret Hindu?” In his pocket he carried a Hanuman good luck charm. 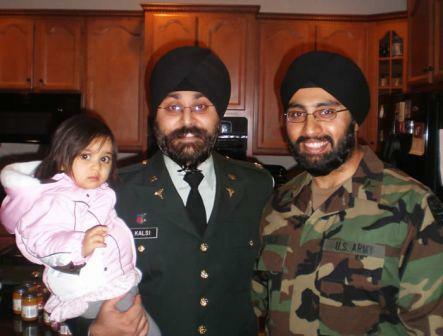 As I understand it, this is not a permanent policy change — in the future, observant Sikhs joining the U.S. military will again need to apply for a special exemption to uniform requirements to be allowed to serve while wearing a turban and unshorn beard. The fact that both Kalsi and Rattan have medical training makes me think that things might be different for someone applying for the same waiver at the ground level. That said, this still seems like a significant shift on a symbolic level, and I would fully expect there to be at least some controversy about it. This is an utter disgrace to the United States and the United States Army. How on God’s green earth did they allow this? It never ceases to amaze me the stupidity in our governments leadership. A civilian made this call on allowing this “individual” (that’s what he is not a trooper), to graduate. He’s a Captain in the US Army. I find your disrespect for our military disgusting, ignorant and anti-American. What kinds of reactions have people been hearing to this news? Obviously, for Sepia Mutiny, which has always defined itself as an inclusive blog for the “South Asian” diaspora, this divison of the South Asian community is a little frustrating. How am I, whose family all originate from what is now Pakistan, of a different racial background from a Mohajir Pakistani, whose family all originated in what is now India? What does it mean to ask a question concerning “race,” and then lists three definite categories that might be understood as “racial,” only to then list nine further options, most of which are clearly nationalities, not “races”? Another discussion-related question: anyone want to speculate on how or whether this division on the census form might matter for the South Asian community down the road? Finally, for readers from Pakistani, Bangladeshi, or Sri Lankan backgrounds, who have received the census form — are any of you thinking of checking “Asian Indian”? 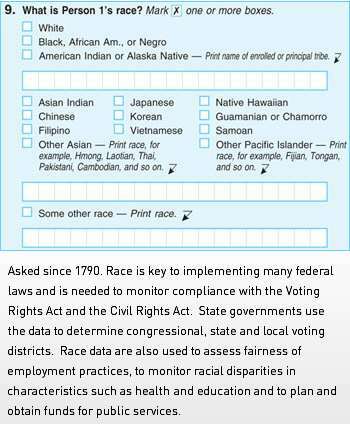 Since the census allows us to fill out more than 1 box under race, is anyone thinking of filling out both “Asian Indian,” and “Other Asian”? One of the greatest unintentional jokes of all time in Bollywood is for me the music video to “Desi Girl.” Behind Priyanka Chopra, who more than amply fits the bill, the video features some fifty blond, caucasian backup dancers. They stay in the background some of the time, but by their sheer numbers they suggest that the object choice celebrated in the song — the eponymous “desi girl” — might actually be an endangered commodity onscreen. Now Marathi nationalist Raj Thackeray, nephew of the infamous Bal, has started a campaign to try and kick the foreign “junior artists,” as backup dancers are called, out of Bollywood. Normally, one feels a kneejerk hostility to opportunistic populists named after famous Victorian novelists, but in this case I can’t help but hope that the results of this campaign might actually be some constructive reevaluation of the Bollywood obsession with gori backup dancers. Leading Indian film director Jag Mundra last night criticised the campaign and said it could push up costs and force film-makers to shoot more scenes overseas. To save money, directors usually hire attractive backpackers passing through Mumbai and shoot dance scenes in local clubs or film sets. “The reason producers pick white girls is because a lot of them have better figures and are willing to expose them,” he said. On bikini shots and the demand of the mass audiences for titillation, yes, maybe (the man knows his titillation). But on “better figures,” is he really saying that with a straight face in this day and age?